It's very comfortable. It's the perfect size for my bed. I received it quickly. It makes my bed much more comfortable than the old featherbed I had previously. Enjoy the dreamy comfort of this white goose feather bed. This hypoallergenic feather bed features a 230-thread count 100 percent cotton top that protects you from quills, and it has a baffle box construction that keeps the genuine white goose feathers in place while providing lift and support, ensuring a wonderfully soft and comfortable night's sleep. This is a good feather topper for the price. I was going to say that it wasn't at first until I did some reading up on feather toppers. Because of the quills you can feel that are plentiful. But this is not a down topper it is a goose feather topper and there is a difference between them. That's why you feel quills like you do instead of just soft down. I have a twin daybed I sleep on I'm 5"10 140lb. female and I got the king size and folded it because for just a couple of dollars more it was like getting 2 and it made it a double because just one is not going to give you much at all of plush fluffy because it is not thick enough. That's why only 4 stars because it's not that thick at all. Maybe 3 inches and that's with some air in it at fluff. But like I said for the price it is worth it but if you don't get 2 don't expect alot of lofty fluffy and since its goose feathers and not down you will need to put a soft cover on top of it so you want feel the quills. I have slept on these for a month or two and you do have to fluff this every single day or at least every other day. Since I have it doubled and the other on top I do mine every other day. But don't have the impression you only have to once a week or other like some reviews say because that's just not accurate especially if you just have the one because after laying on just one it will be flat as a pancake after a hour or so. I also got one of the other toppers the little 5 inch twin gusset down and feather topper to go on top of this one to actually get the plush I wanted without it going completely flat when layed on. Which fluffed with the air its 5 inches. It actually has about a 1/4 inch of down pillow top on it and then the goose feathers so it went on top of this one. With that being said these is not as hot as the gel memory foam mattress that I put it on. Goose feathers is not as hot as down. Look at the price you pay for a cheap down comforter. So this is worth the sale price it usually stays at. Keep in mind these are toppers not a mattress. There for to get a mattress feel you have to have thickness. So after I built my bed I'm happier lol. My photos show the folded king and then with the other on top all fluffed lol. This featherbed is perfect. I literally went to about 7 high-end stores looking for a featherbed and this one is higher quality and much better priced than anything I saw. Not to mention it's just like sleeping on air. I have never had such a good nights sleep. It just envelopes you into a heavenly soft sleep. 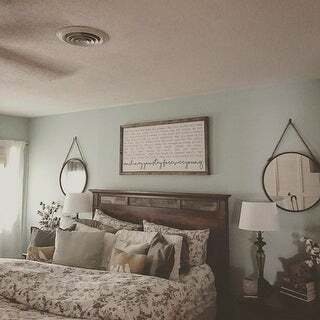 I would absolutely reccomend this to anyone who is looking for a featherbed. The reviews I read for this product were so helpful in helping me pick it out. I was reluctant at first, but it came exactly as described by overstock.com and by all the reviews I read. I was hesitant to purchase something down without being able to feel it. Too many times I had found items in stores that were just o.k., but not what I wanted, and I didn't want to have to ship something back. I spent lots of time going over many different featherbeds and the reviews. I was still not sure if I should get the real down feathers since I purchased a cheapo at a local store and it was horrible, thin and feather ends poking all over. I was determined I was going to have my bed feel like the upscale hotel I stayed in in San Francisco, the Sofitel. The hotel had a down comforter and a down featherbed that you just sank into and it was what I really wanted to re-create. I decided this sounded and looked like what I wanted, so I would try it. Much to my surprise it surpassed my expectations! I cannot believe the price for this hotel quality featherbed! It is so thick and full you bogg up in it! I look forward to getting in bed every night now! I had purhased a new plush mattress but had sore points prior to putting this on, now I could stay in bed all day! Literally, I don'-t remember ever turning over anymore! Only wish I had purchased sooner. If you are looking for a featherbed, get this! I don'-t even see that it flattens at all after sleeping for days on it. When I pull the sheets up, I just give it a shake anyway to fluff. I didn'-t want to chance smushing it any, so I did like the hotel and just put it in a protector and laid it on top of the mattress. I guess if you wanted it to match the sheets you could put a separate fitted sheet on it. Anyway, this is the best purchase I have made in ages and am telling my family to get it, since they love the hotel bed feel too. This thing is worth way more! I would have never imagined such good quality for a fraction of what you would pay at a department store or hotel store sight. I could go on and on, because I am so in love with this featherbed. In short, do not hesitate to get this! I am enjoying my luxurious baffle box 230 thread count white goose featherbed a great deal. I had one previously but it wasn't baffled and the feathers would flatten or shift. This one does not do that so the comfort zone is great! If you want the feeling of sleeping on clouds then you should try this Baffle Box 230 Thread Count White Goose Feather bed. The baffles sewn in keep the feathers evenly distributed to make the feather bed nice and thick. I have tried many items to use to sleep on due to having back problems and have found this to be the answer. I also purchased from Overstock a duvet cover to put this feather bed into to keep it clean and fresh. You just fluff it up prior to making your bed and it's ready for a good nights sleep. We just got our feather bed yesterday, tried it out last night along with our new sheets. What an excellent sleeping experience. So very comfortable I did not want to get out of bed.. I was worried after reading many reviews on other feather beds that the feather would just separate when the bed was laid on but this did not happen. The feather bed seems to be filled with plenty of feathers. We bought this to go over our Tempurpedic bed to make it a little more cozy and this certainly did the trick. Plus the Tempurpedic has a water proof cover to protect it which makes me sweat, and I'm not a sweater. So we bought the feather bed to try and give a little airflow between us and the mattress, it did the trick and believe it or not, no sweating or getting hot last night. I highly recommend this feather bed based on it's comfort and especially the price. On a side note, just in full disclosure, I did notice a few brown feathers here and there inside the feather bed. So it is not 100% white goose down even though the tag only lists goose down as the filler. But for the price one could expect far more brown feathers. I've seen feather beds at department stores not near the quality of this one but far more expensive. I would snag one of these if you are in the market for a feather bed. I ordered a cover and recommend others to do the same so it can be washed since the feather bed is dry clean only. I have had this Luxurious Baffle Box 230 Thread Count White Goose Featherbed for about two months now and I am very pleased. I was suffering from some back pain and noticed that I was turning a lot at night when sleeping but now that has gone away. I placed it directly on top of the mattress and my over sized sheet set covers perfect and keep it in place well. Overall I would highly recommend. So wonderful to snuggle down in, in the winter. 5 inches of softness. just shake it each morning as I make the bed. Finally received this feather bed....just a note, for some reason shipping was SLOW for this item....usually Overstock is quite fast...Never the less....this feather bed is very nice quality especially for the price...I ordered the King size for my Queen sized bed....the weight at 14 lbs is excellent....the FB fluffed up very quickly out of the bag with little effort on my part and the loft is great! Also...some reviewers have reported an odor and i will say that there was/is NO ODOR from this item....and the baffles keep the feathers from shifting quite well.Now, i know this may seems odd....but i actually sleep UNDER the FB instead of on it....not my choice but my partners...the 250 thread count for this FB is sufficient to keep the goose feathers from poking through....i did order a duvet to put the FB in....I am convinced this feather bed is the best possible one i could have purchased for the price i paid....you will not be disappointed with this item! I love the white goose feather bed,great for my back. I did put a cover on it also. I am a huge believr in feather beds and had one for about 8 years that I loved. Although the old featherbed was still somewhat comfortable, I felt like it was time to buy a new one. I was so excited when my featherbed arrived on time. I immediately put it on my bed and the first two nights I felt like I was sleeping on air. By the third day, however, the featherbed had flattened and I couldn't even tell I had extra padding on mattress. The feathers tend to leak a bit as well. Comfort-wise, I still feel as though I am sleeping on a mattress. Great product. It retains body heat, is soft and made in the USA. I don't have to use my electric blanket anymore. This feather bed has sharp quills. I'm used to one with a down pillow top and I would highly recommend you get a down pillowtop featherbed to protect you from the sharp feathers - or at least get a down cover for the featherbed. Also, this one does not sew the baffles all the way through so the feathers do not necessarily stay in the same area. Fabric quality nice. Shipping prompt and affordable. Overstock gives great service. 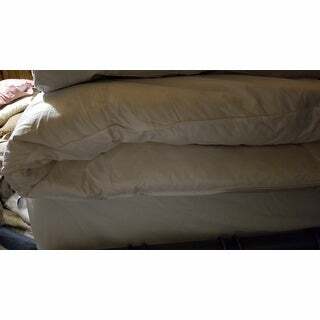 We have used this featherbed for just over 3 months now and it is better than great! I use a pillowtop mattress cover over it and have never had even one feather poke us. We fluff and turn featherbed @ every sheet change and I've never seen one feather come out of it. I bought this product because of all the great reviews and we are so satisfied. Thank you Overstock. It was hard to find bedding for our California King mattress until I found you. I buy all my bedding from Overstock. I won't shop for linens anywhere else. The quility and price can not be beat! I really enjoy this featherbed - it is full and comfortable. It did have an odd smell upon arriving but aired out quickly. It does need to be fluffed every 2-3 days to maintain shape but overall, a great value for the price. I bought this on overstock for cheap with free shipping. I bought featherbed because I was sleeping poorly, and was constantly rolling around at night. This really helped and I highly recommend others purchasing this product. This is about the fourth feather bed I have purchased - not from you - and this is thefirst one I don't have to plump up dailey or even weekly. I had no oder like some others I've purchased. In other words perfect. i have purchased featherbeds in the past but this one was the most uncomfortable ever!!! i tried for 2 night the feathers kept on pricking me and coming through. it wasnt soft and airy it just went flat when i slep on it. So when i returned it, it cost $30 each box (because i purchased 2) in shipping fees, also 4.95 for restocking fees that come off my bill. I was very unhappy about that. i could buy a brand new one somewhere else for that price. I had read all the reviews and i thought it would help but i guess not i dont what these other people bought but i was very un happy!!!! This down mattress topper seriously makes you feel like you are sleeping on a cloud! Don't spring for the pillowtop mattress - just get this fluffy dream! Very comfortable. Would be helpful to have corner straps to hold to the bed. Purchased this for my grand daughter. She absolutely LOVES it! Said it felt like sleeping on a cloud. I will be purchasing more for my other grandchildren. Great addition to mattress and boxspring set. Makes a perfect place to cuddle. Because a couple weeks after I received it and had put it on my bed I would lay down at night to go to sleep and I would have feathers poking me. I’ve had featherbeds before and this has never happened. So I’m a little disappointed with it. It is very comfy but the feathers shifted away from the center after awhile. It needed to be redistributed. It kept the temperature regulated, so I was nice and cozy in the winter. WOW! Received my Luxurious Baffle Box one day early, so fluffy & beautiful. 24 hours later we had the best night of rest in several years. No sleeping pills, no waking up doing the night. Fewer back aches in the morning. Our bed has offered us years of pleasure however, as I get older I wanted the feather fluff I remember as young child that my grandma made. Baffle is giving me that and increased the height of our bed to 7 inches. Thanks for granting me this wonderful sleeping joy. This is my first, but certainly not last order from overstock. 5 Big stars. "How do I get the feathers to spread out again? It's supposed to be boxed and stay in place but after having it for 2 months all of the feathers are at the bottom and top." "i want to feel like i am being "swaddled" and surrounded by fluff, is that what you think i will get? i see its fluffy and all, just want it to help with my anxiety and sleep better as if there were a lot of fluffy blankets around me in a bundle of...fluff! i know its a weird description but if its like that, that would be awesome!" "What is the UPC of this item? " "how thick is the topper?" it is thick. the only downside is waking up with feathers scratches all over and constantly picking up little feathers. My boyfriend and I couldn't take it. we threw ours out after 2 months. When fluffed it is about four inches thick. I recommend putting some type of cover over it to not only protect it, but to keep the quills from poking out. There are covers made for this purpose, but I simply use a fitted sheet and it works just fine. Very thick. Much softer/smushier than I had anticipated. It's very thick and fluffy. I don't have the issue of the feathers all over like the other feedback suggested. I put it under a deep fitted sheet. "How long does the feather bed last before it becomes compressed? If you shake it out does it fluff back up?" It does but it really compresses. "Hi there! Does this come with an extra cover? Cause I'm not sure whether the 230 TC cotton refers to the material of the featherbed or an additional cover that comes with it." The outside casing of the featherbed is 230TC cotton. It doesn't come with an extra cover. I would recommend putting one on it though, or a fitted sheet around it works nicely, also. This product is not yet released, and is expected to ship on Feb. 21, 2006. This date is subject to change. In order to assure you receive Overstock.com's low price on this item, your credit card will be charged upon order placement. The item will ship immediately upon release.